For students attending Dawurr boarding at Nhulunbuy High School, the 18 hours spent outside the classroom are just as critical to their success as the hours spent inside the classroom. 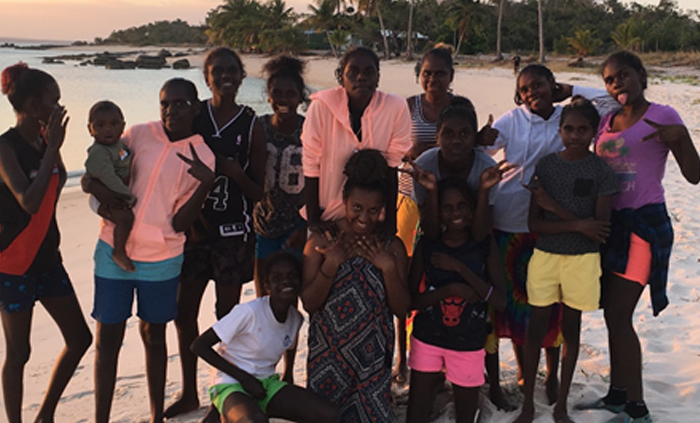 As part of Dawurr’s cultural program, a group of female students aged 13 to 17 went on a women’s trip to Bawaka, a significant Yolŋu place, where they spent three days and two nights getting back to country and reflecting on the importance of learning. Bawaka Traditional Owner Rrawun Maymuru led the experience which focused on the student’s personal learning journey and included lessons about kinship, respect and cultural connection. Rrawun grew up at Bawaka and received his education via school of the air. He now operates the family business - Lirrwi Tourism, a successful Aboriginal cultural tourism enterprise. “We are learning every day; what we see, what we touch, what we hear – it’s all learning,’’ he said. Hunting was central to the students’ learning as they waded through mangroves collecting mud mussels, worked the tides to catch fish for dinner and clambered on rocks to dig maepole (oysters) out of their shells. “We have been camping and hunting and fishing. We also did Bungul, dancing next to the fire. We put on our skirts and did the dances for the plane, the emu and fish,’’ student Noelle Yunupingu said. Rrawun shared with the students his story about setting up his tourism business and the learning and hard work it took to get him where he is today. “Every time you’re in class listen, with the pen and paper. That’s the job to learn. If you do that every day Monday to Friday, one day you’ll be somebody,’’ he said. Each of the students has their own dreams for the future and for Debbie Guyula, that dream is to become a female ranger, living in her community of Donydji and working to look after her country. Student Grace Durrurrnga loves to play basketball and wants to pursue a career as a sport and recreation officer working for the shire in Ramingining. Dawurr boarding school is home to about 27 Aboriginal students from communities across East Arnhem Land. It is the first boarding school in the Northern Territory that provides boarding for students close to home so they can remain on their country while attending secondary school.